This chicken is really lovely! 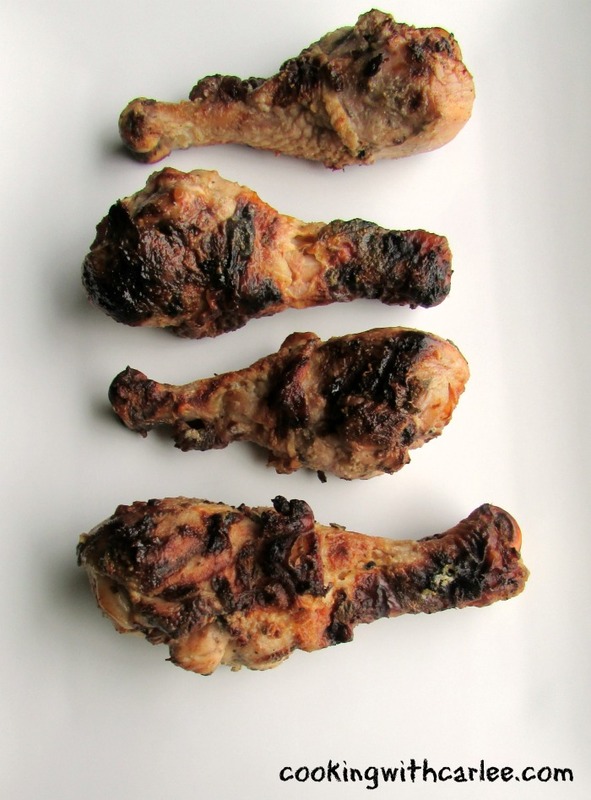 It comes together super easily and the lemon and yogurt really make for juicy, tender and delicious chicken. This was Matt's favorite part of the Greek inspired feast, I would guess. It would be hard for me to pick between this and the pita bread (Hello, I'm Carlee and I'm a carbaholic). He loves grilling anyway and really seems to like it even more when I come up with new marinades to try. The char siu chicken we made for the poultry grill-off has inspired him. We still need to make that chicken again so we can get pictures and write a post... and he is already asking for this chicken again too. Our "to make" list is always longer than our time to make it! Luckily this chicken really doesn't take any time at all, so I am sure we can get back around to it soon too. I'd like to get some better pictures, so that always moves a re-make up the list. (It's hard to justify making something we just had again when there are so many other things to make and share!) Not only has he asked for it again, but he has been telling people about it. That's an even better sign. I guess I better get to it. All it takes is tossing the ingredients in a bag and letting them mix and meld for a few hours. 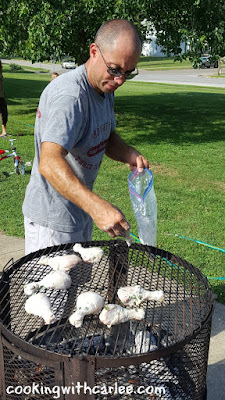 I did get in there and flip the bag every so often and gave the drummies a gentle massage a few times just for good measure. Mostly it was because I was in the fridge anyway and it seemed like the thing to do. I am sure they would have been just as delicious without the extra love and attention! This Greek week is off to a pretty tasty start. Now I want to know... what are your favorite Greek foods? And what is your favorite chicken marinade? We want to try them all!! In a large zipper topped bag, mix together the marinade ingredients. Add the chicken to the bag, seal closed. Then roll the chicken around in the marinade to make sure it is all coated. 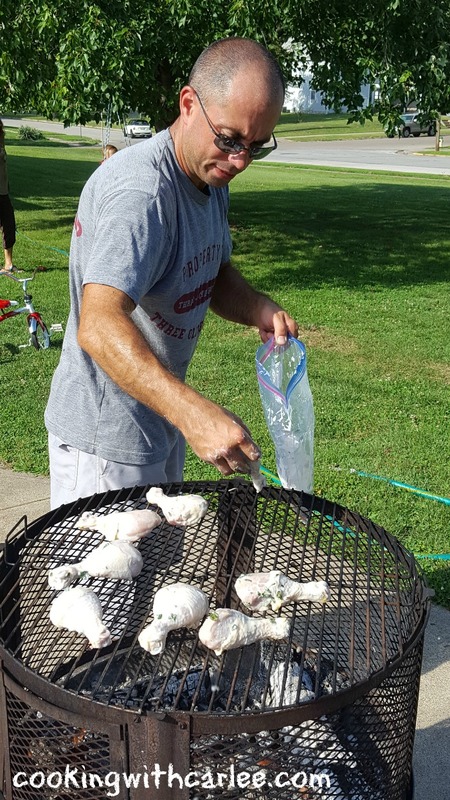 Remove chicken from marinade and grill until it reaches an internal temperature of 165 F.
You better believe it's off to a tasty start!! My boys would devour these!! Oh the lemon is what had me, YUM!!! Lemon gets me every time too, sweet or savory! Thanks, Andrea. You always make me smile! Thanks for the recipe and your sweet visits! It is really good, Julie! I hope you give it a try. I love recipes like this where I throw a few things together, my husband does the grilling and then we sit back and take in the compliments! ;-) I always love seeing what you are up to! I must have seen this on Instagram before? Any way, somewhere you shared it, I was hoping the recipe would follow! Definitely sounds like a recipe we would be enjoy! Probably! I think I posted it the night he was grilling. It is definitely one that is worth trying! This looks so good. I love the flavor of lemon, especially in the summer. And I've never tried yogurt in a marinade. I bet this would be good lots of ways, on breasts and used on a salad, or even in chicken salad. You are making my grilling list longer each week! ARG! Favorite Greek foods? Gyros! Love them. And Greek salad too. I love how fresh tasting Greek food is! My mom used to marinade chicken in yogurt for an Indian inspired recipe that I still need to get for her. I think the yogurt and the lemon juice really work together to make the chicken extra tender. We are definitely making this again soon! Gyros are my favorite too! I am not an olive person, so that rules out a lot of Greek food. But otherwise I love everything I've tried! 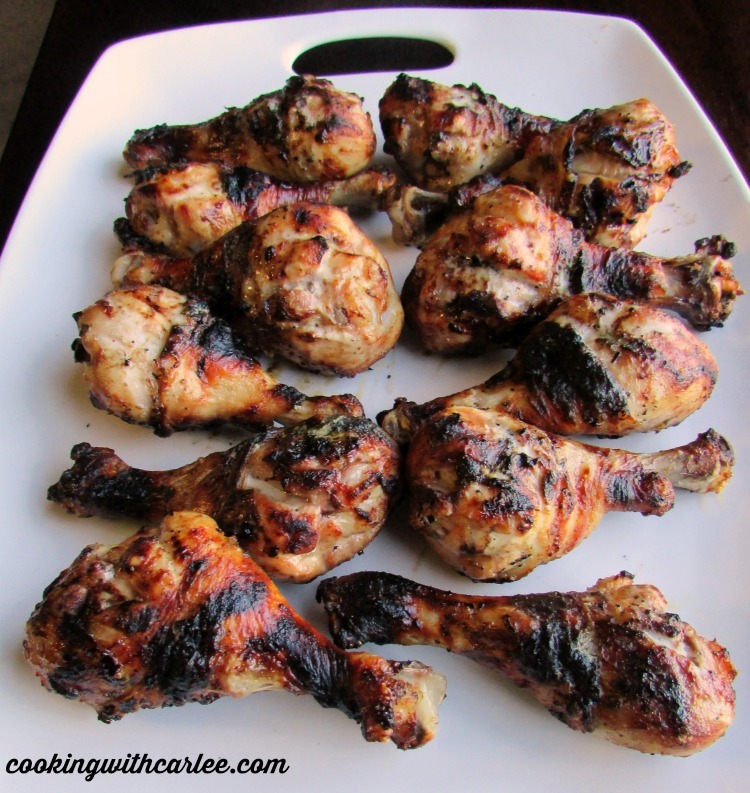 This looks like a great Marinate, we love grilled chicken! Thanks so much for sharing with us at Full Plate Thursday and have a great weekend! We do too and this recipe is going to be in the rotation a lot for a while. Thanks, Miz Helen! Yum, Carlee! I want to see the char siu chicken, too, but this sounds incredible! I love the idea of a Greek feast! We're having company this week, and now I'm inspired. I've been at a loss as to what to make. We definitely have to do the char siu chicken again soon. It was so much fun to make, but I was too wrapped up in the competition to get good pictures! We're doing it soon!! I am sure whatever you decide to make will be perfect! 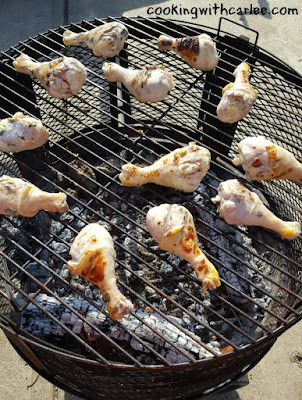 Hi Carlee, I do like the sound of this and as we are always slinging chicken on the fire these days a lemon and yogurt marinade would make a nice change. When I marinade I usually stick it all into a glass dish, but putting it into a bag makes more sense and less washing up! There are so many tasty Greek dishes that it's difficult to pick a favourite, but a decent gyros pita or lemony potatoes with chicken have to be up there as our favs. A dish certainly works too, but it is kind of nice to have all of the mess contained! I try to use reusable stuff as much as I can, but I love the ease of marinating things in a bag. Mmmm, I should have made some lemony potatoes. You don't happen to have a recipe posted do you? I hope all is well in Greece! Thanks for popping over! Question: Since I don't have a grill, can I use oven? These are perfect! 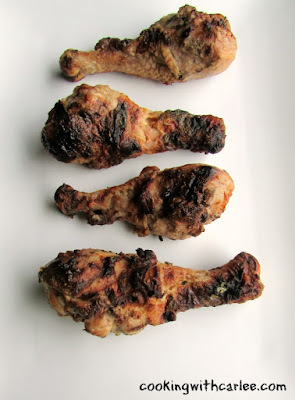 The legs are always fun to eat, they remind me of being a kid. Thanks for the yummy recipe! I'm sure that marinade makes for a wonderfully juicy chicken leg. I bet that lemon and yogurt combo is amazing! My daughter will love this one! It's alot like the lemon pepper yogurt dressing I made for the grilled chicken and asparagus salad! 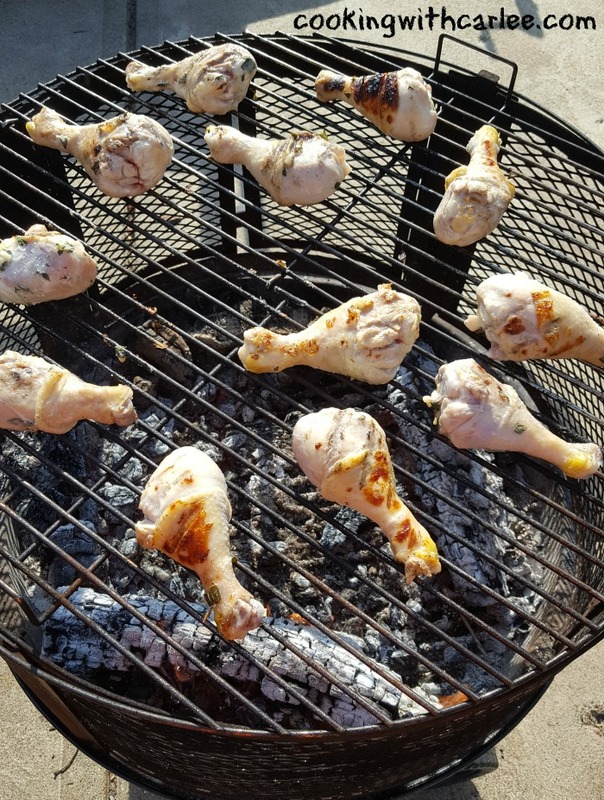 Perfect for our grilled recipe round up!